Global Environmental Management Principles Our teams are guided by a companywide Environmental Health and Safety Management System and work systematically and continuously to identify ways to minimize our impact on the environment. Climate Change and Energy We are committed to the responsible management of energy and greenhouse gas (GHG) emissions through strategic energy sourcing and on-going improvement of our energy management systems. Conserving Water and Managing Wastewater A high quality water supply is critical to ensuring that all aspects of production meet Mylan’s high quality standards. We recognize that water is a scarce resource and are committed to working proactively to protect water resources. Reducing Waste Mylan’s companywide EHS standards, along with industry regulations, govern specific handling, treatment, storage and disposal of all waste. Waste treatment methods are selected based on the type of waste and treatment requirements. Minimizing Pharmaceuticals in the Environment We promote responsible manufacturing to minimize environmental impact while balancing the need to produce high quality, life-saving medicine. Decreasing Air Emissions Our facilities are equipped with air emission control devices as required to manage regulated air pollutants. 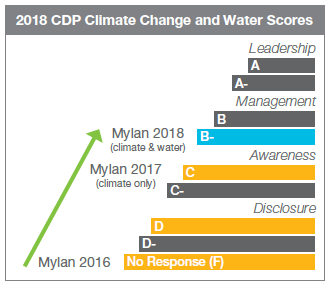 Mylan’s Global EHS Management System is based on companywide principles that provide a framework of performance expectations with respect to our employees and external partners. Our technical standards establish global minimum operating requirements for a variety of safety and environmental activities. Implementing these standards helps ensure compliance with applicable regulations in the countries where we operate, in addition to filling gaps where certain regulations may not exist and driving continuous improvement. We monitor and track many elements of our environmental performance allowing us to manage data, oversee results and identify risks and opportunities. We routinely conduct assessments and on-site audits, including reviews of our data, systems and programs. We work diligently to practice responsible water management and protect this precious resource. Our highly regulated industry often presents restrictions and limitations related to items such as reuse of water in production. Production requirements of our operations – coupled with local regulations and infrastructure – guide the type of water and wastewater management systems and processes we utilize. Due to these requirements, a significant amount of water is rejected as part of the purification processes and is discharged as wastewater. Wastewater from all of Mylan’s operations undergoes treatment prior to discharge to the environment, and in India, multiple sites apply zero liquid discharge (ZLD) technology that eliminates discharge. Please read our 2018 GSR Report for additional information. While gaps remain in the scientific link between pharmaceuticals in the environment and human health risk, we are committed to reducing pharmaceuticals discharged from our manufacturing operations. We are a member of the AMR Industry Alliance. All member companies are committed to addressing AMR across four key areas: research, appropriate use, access and manufacturing and the environment. Mylan participates in their manufacturing working group and supports the Common Antibiotic Manufacturing Framework. 1Caldwell, D.J. (2015) Sources of Pharmaceutical Residues in the Environment and their Control, from ‘Pharmaceuticals in the Environment’, 2015, 92- 119 Editor(s): R E Hester, R M Harrison. Royal Society of Chemistry, London, UK. 2BIO Intelligence Service (2013), Study on the environmental risks of medicinal products, final report prepared for Executive Agency for Health and Consumers, pp. 46-47. We continuously evaluate and identify opportunities to lower our energy demand usage and decrease GHG emissions. As part of our work to support responsible manufacturing efforts, the U.N. Global Compact and SDG 13, we work to reduce our absolute total GHG emissions (Scope 1 and 2). Many of our sites completed energy management projects in 2018, such as making equipment improvements, installing LED lighting and purchasing renewable energy. We also identified opportunities to phase out certain ozone-depleting substance (ODS) refrigerants. In 2018, we purchased 72 million kilowatt hours of renewable energy from local renewable energy suppliers, an increase of approximately 30% since 2017. We disclose our performance through the CDP Climate Change Program and in 2018 increased our engagement as an official CDP Supporter. Our 2015-2017 GHG emissions data were verified by a third party. We have applied the same data validation approach for reporting to CDP for 2018 data. In all our operations, we are committed to reducing waste through responsible use of resources, increased recycling, reuse of materials and initiatives dedicated to waste minimization. Across our sites in 2018, we recycled, reused or repurposed 26% of total waste generated and 44% was sent to various energy recovery facilities. Ninety-five percent of our pharmaceutical waste is diverted from landfill to incineration or energy recovery facilities. We continue to strive to reduce or eliminate the amount of waste sent to landfills and are looking to increase the number of zero landfill sites. We encourage our patients and consumers to dispose of unused or expired products or waste materials in accordance with local regulatory requirements. We use new technology as it becomes available. Examples include high-efficiency dust collection, HEPA filtration, electrostatic precipitation, primary and secondary condensers, multi-stage filtration and recirculation systems, process scrubber technology and regenerative thermal oxidizers.